Not online? Take a message and call your customer back! What happens when no one is around to answer live support chat requests? 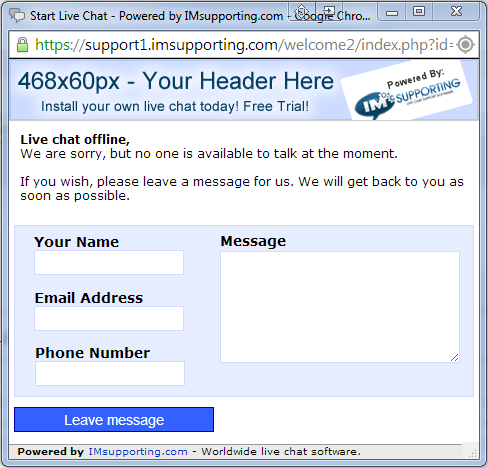 The IMsupporting live chat software allows you to do one of three things when live chat is offline. 1) Set your chat to offline. No one can contact you or leave a message. 2) Set your chat to offline, allow people to leave a message for you to answer later. If you set your live chat to allow message recording. Your visitors will be given the option to leave you a message with their contact details. A copy of this message is sent to your nominated email address and is recorded inside the live support system for you or your support teams to review next time they are online. Offline messages is a great way to still help users when they simply don’t want the hassle of sending emails or phoning your contact centers.